Several years ago I looked at an application called Google Earth, a program which allows you to view literally any corner of this Earth from satellite imagery without even leaving your desktop.This is genuinely one of the most interesting applications that you will ever use and bizarrely, it is completely free of charge. I was prompted to revisit this piece of software for a couple of reasons.Firstly, the map data has been completely updated and so whereas before the level of detail for Torbay and the surrounding areas was a little poor, you can now get right down to street level – I was even able to pick up the pot plants on the roof of Refresh. Additionally the Herald Express have kindly agreed to let me use pictures in future articles and because a picture is apparently worth a thousand words, I thought more would be encouraged to download it by seeing the application in action. 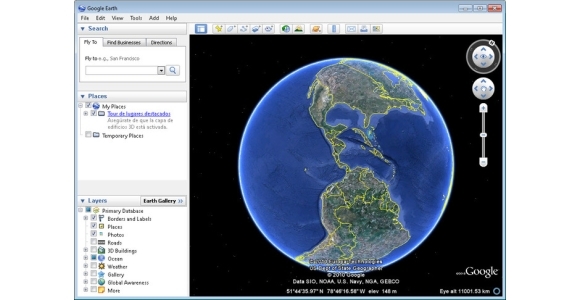 Google Earth can be downloaded free of charge from http://earth.google.com and because all of the satellite imagery is streamed directly from the Internet the application itself is a tiny 13mb in size.When you first start up the application, you will be presented with a picture of the Earth, as it is viewed from space.From here you can fully manipulate how you view this globe by either dragging it in order to rotate to a different continent or zooming in so that you can look closer at a particular area. The most impressive thing in my eyes is that it is all completely seamless; if you want to zoom in on Paignton for example you just spin the globe to England and then start zooming and then as you get closer adjust your trajectory so that you are looking at the South West, then Torbay before finally getting to street level.It would have been a lot easier for Google to control your view in set stages, from 20,000km altitude right down to the closest zoom level of 8m but instead they allow you to zoom metre by metre. Literally every area of the world has been charted, and as such even if you look out in to the middle of the Sahara desert or Antarctica they are all meticulously photographed.Of course these areas all look the same to the human eye from above, but it is still impressive that satellites have photographed every square inch of the globe. There are search facilities built in to the application so you can quickly and easily locate a certain area, postcode or landmark and rather just giving you the imagery, Google Earth also highlights areas of interest.These can either consist of photographs, Wikipedia articles, information gathered from the Internet such as local business information or even representations of the buildings that you’re seeing in 3D. Rather remarkably you can flip the view around so that you’re viewing the sky from your current position on the Google Earth map and explore the universe using exactly the same interface and it’s at this point where the power of this application really does start to sink in.You are sat on your computer, using a free 12mb application and suddenly you can view any place on this Earth or if you’d prefer, take your pick of millions of stars and galaxies…. remarkable.